The global fresh meat packaging market is highly fragmented in nature and going forward too is expected to remain the same. In 2015, top ten leading players held just one quarter of the share in the market, vis-à-vis overall value. Some such prominent participants are Sealed Air Corp., DuPont, and Amoco Ltd. In order to steal a march over their competitors, most savvy players in the global market for fresh meat packaging are investing heavily in product innovation to come up with a more diverse offering. This way, they are trying to tap into a much wider client base. The companies are also seen leveraging mergers and acquisitions to bolster their positions. A report by Transparency Market Research finds that the global market for fresh meat packaging will likely expand at a lackluster CAGR of 2.3% during the period between 2016 and 2026. At this pace, the market, which was worth US$1.92 in 2015 will become worth US$2.47 bn by the end of 2026. 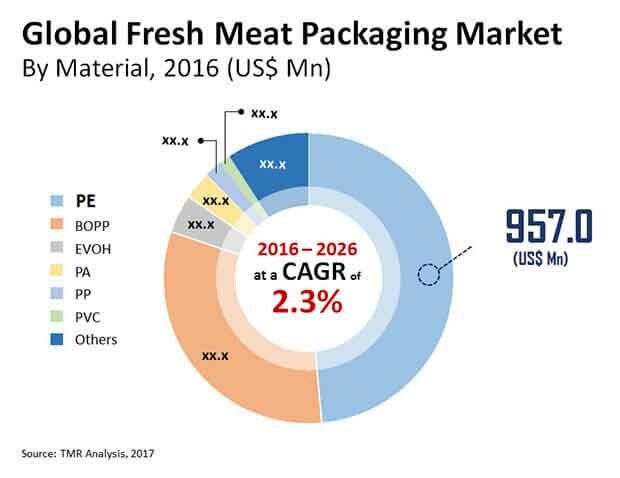 Some of the key technologies used in the global market for fresh meat packaging are vacuum skin packaging (VSP), modified atmosphere packaging (MAP), and vacuum thermoformed packaging (VTP). Among them, the technology of VSP is seeing maximum uptake and in the future will see even more adoption. The TMR report predicts the segment to become worth 32% by 2026-end. Geographically, the key segments of the global market for fresh meat packaging market are Latin America, North America, Eastern Europe, Western Europe, Asia Pacific excluding Japan, Japan, and the Middle East and Africa. At present, North America holds a sway over the market and will likely maintain its firm position in the years ahead too. This is because of the quick uptake of fresh meat packaging among meat producers and the rising investments in research and development. The market in North America accounted for about 36% share in the market in 2015. Primarily fuelling the global fresh meat packaging market is the growing urbanization, worldwide, and the rising awareness among people pertaining to the risks involved in consuming food such as meat not packaged properly. “Fresh meats, in particular, need superior forms of packaging as they can be easily infected. The types of fresh meat packaging that have been launched in the market in the past couple of years have allowed meat to be stored for longer periods of time and this has consequently allowed market players to tap into a much wider client pool, globally,” says the lead analyst of TMR. Further, the global fresh meat packaging market is also being powered by rising demand from countries where meat consumption was low previously. Proving counterproductive to the market, on the other hand, is the rise in prices experienced by almost all kinds of meat manufacturing, particularly pork and beef. This coupled with the advent of expensive packaging and meat processing methods and equipment is serving to hamper the market.